Like many large enterprises that have grown through acquisitions, Olympus Corporation of the Americas (OCA) owned multiple, disparate HR tools and technologies across its group of businesses and entities. To support its initiatives of embracing One Olympus — a philosophy of continuously unifying its businesses and entities — and maximizing the performance and efficiency of the entire Olympus Group, Olympus Corporation of the Americas understood that one HR talent management solution would assist with unifying employees across the individual Olympus companies and locations. 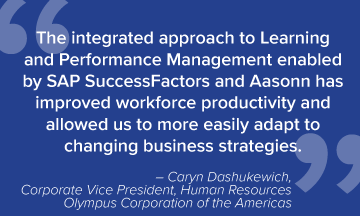 As a result, Olympus integrated and standardized the Americas on a single cloud-based platform for key talent processes such as learning and performance management. With the SAP® SuccessFactors® HCM suite implemented by Aasonn, Olympus achieved cost savings, increased organizational agility, and more effectively engaged its employees. Olympus is a global technology leader, crafting innovative optic and digital solutions in medical technologies, life sciences, industrial solutions, cameras and audio products. Their solutions enable specialists to look inside the human body, further scientific research, ensure public safety and capture images of the world. Throughout their nearly 100-year history, Olympus has focused on being true to people and making lives healthier, safer and more fulfilling every day. 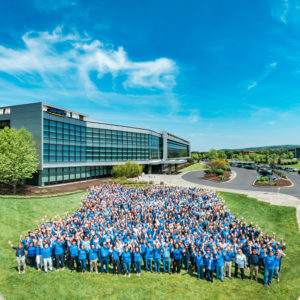 Olympus Corporation of the Americas (OCA)—a wholly owned subsidiary of Olympus Corporation in Tokyo, Japan—is headquartered in Center Valley, Pennsylvania and employs more than 5,100 employees throughout locations in North and South America. For more information, visit www.olympusamerica.com. OLYMPUS…TRUE TO YOU. TRUE TO SOCIETY. TRUE TO LIFE. Goal management, performance reviews, and training were all handled differently across Olympus’ various businesses. For goal and performance management, some businesses used an in-house system, others used Microsoft® Excel®, while still others were using a third-party solution. Training courses were managed across many different learning management systems (LMSs) across the organization, also creating inefficiencies. User support proved time-consuming and employee communications required customization based on the local systems and processes, causing an HR administrative burden. Overall, the lack of standard systems and common processes made it increasingly difficult for Olympus to develop a common core culture and adapt to changing business strategies and conditions. Olympus recognized the need to standardize on a single talent management platform to drive cost efficiencies, improve scalability, and create a consistent organizational culture across its many businesses. After examining many talent systems on the market, Olympus standardized across the organization on the SAP SuccessFactors HCM Suite. Olympus chose SAP SuccessFactors’ fully integrated, cloud-based talent platform as it was the most user-friendly and robust system evaluated, resulting in a shortened learning curve and reduced adoption time. SAP SuccessFactors provided a fast and easy integration solution between the SAP ERP HCM on-premise system that Olympus operates and the SAP SuccessFactors cloud solution; therefore, standardizing on a SAP solution made sense for Olympus. With the solution identified, Olympus researched multiple third-party integrators, selecting Aasonn to guide them through the configuration and implementation process. As Aasonn is recognized by SAP SuccessFactors as one of their most experienced implementation partners, the knowledge and proficiency of the Aasonn team for SAP SuccessFactors implementations was unmatched. Through Aasonn’s guidance, Olympus implemented SAP SuccessFactors Employee Profile, Learning, Performance Management, Goal Management, Succession, Career Development, Compensation, and Workforce Analytics and Reporting. With the team in place, Aasonn started the project by sharing their implementation methodology, including proposed roles and responsibilities, module workshops, configuration workbooks and iterations, change management and launch plans. Olympus and Aasonn created an overall project launch plan with Olympus electing to launch SAP SuccessFactors modules every few months, launching the first module (the Employee Profile) within three months – a fast deployment designed to quickly engage employees and drive user adoption. For SAP SuccessFactors Learning, Olympus staggered the roll-out, beginning with two smaller, regional businesses. Next, they deployed the solution within a large manufacturing company that had an entirely different user base and multiple locations, before launching the solution corporate wide. “Using SAP SuccessFactors, we have been able to consolidate many different learning management systems in use across multiple businesses into a single, fully integrated and cloud-based platform,” said Adrian Marsh, Vice President, Information Technology and Business Optimization, Olympus Corporation of the Americas. The phased rollout was a useful way to balance the workload of internal resources, confirm system performance, ramp up the help desk support, optimize user communications and reduce overall project risk. With a single, integrated, cloud-based talent platform, Olympus streamlined and simplified key talent processes, enabling consistent application of HR best practices on an enterprise-wide scale. Aasonn’s implementation process also allowed for an improved end-user experience and realignment toward a more strategic focus. By integrating Goal and Performance Management, for example, Olympus more effectively aligned individual and organizational goals. This increased organizational agility, allowing Olympus to rapidly adapt to changing business strategies. Knowing that learning systems would be consolidated, Olympus planned for some user resistance, but instead was surprised by the overall response of end users. Departments actually requested to move more training courses and more historical training records online, increasing training courses by 60% without hiring more administrative staff. With more efficient HR processes and a user-friendly talent platform in place, Olympus also improved employee engagement and workforce productivity. In a survey to gauge employee satisfaction with the new Goal and Performance Management processes, 55 percent of employees cited time savings compared with the prior year. When it came to employees’ views on how effective the SAP SuccessFactors platform was in terms of helping manage goal achievement and personal development, the survey also revealed a favorability increase over the prior systems. By consolidating on a single talent platform across its multiple businesses, Olympus achieved cost efficiencies and improved scalability. SAP, SuccessFactors and other SAP SuccessFactors products and services mentioned herein as well as their respective logos are trademarks or registered trademarks of SAP SE (or an SAP affiliate company) in Germany and other countries. All other product and service names mentioned are the trademarks of their respective companies.